This is an annotated version of the article Plural Marriage and Families in Early Utah at lds.org. To display the annotation, click on the note numbers at the end of a paragraph (Note 1, Note 2, etc.). Click again to hide the note. The annotations are not part of the original article. The Bible verses quoted in the endnote to this paragraph only indicate thatpolygamy occurred, not that God declared or commanded it. There is only one verse in the entire Bible (2 Samuel 12:8) that could be interpreted this way for one specific case. Every Bible story involving polygamy paints a grim picture of lovelessness, jealousy, deceit, adultery and murder. Most readers will not likely conclude from this that polygamy was a commandment from God. The Bible does contain some regulations surrounding polygamy but there is little evidence that the Mormons followedthese. Leviticus 18, for instance, prohibits men from marrying a mother and her daughter, as well as marrying sisters, yet both practices were frequent among Mormons (Campbell & Campbell 1978; Daynes 2001, p. 70). Actually, it’s the other way around: the revelation was drawn up in accordance with the practice of plural marriage. This revelation was dictated on July 12, 1843 while Joseph Smith’s first extra-marital relationship with his 16-year old maid Fanny Alger (considered a plural marriage by some, see Bradley 2010) dates back to 1833. Between Fanny Alger and the revelation, Joseph Smith took 26 additional wives (see Compton 1997 for information about Joseph Smith’s plural marriages). Some of his associates had also started practicing polygamy before the revelation was recorded (Smith 1994). Joseph Smith’s polygamous marriages were not limited to relations between “one man to two or more women”. Of his 34 wives, 11 were already married to other men. These wives usually remained with their legal husband during their relationship with the prophet. The last polygamous marriages in the Mormon church were performed at the beginning of the twentieth century. No new plural marriages were contracted since then but existing polygamous marriages continued and the persons living in such families were considered church members in good standing (see Kimball & Miner 1980, p. 142 for an example). The last of these polygamists died in the mid-1950s. All in all, polygamy was practiced in the Church of Jesus Christ of Latter-day Saints for well over 120 years, about two thirds of its existence at the time this essay was written. What is presented here as sudden inspiration was, in fact, the result of a long political and legal battle that for a while even looked like it would be fought with military means (see Bigler 2005 for an extensive historical overview of the various aspects of this process). However, polygamy was not the heart of this conflict. The real issue was the question whether Utah would be a Mormon theocracy or a constitutional American democracy. For both parties to this conflict, polygamy served as a means to mobilize public opinion against the other side (Quinn 1997, pp. 262-313, 329). In this statement, known as the Manifesto, President Woodruff declared his intention to abide by U.S. law forbidding plural marriage and to use his influence to convince members of the Church to do likewise. Estimates of the number of polygamous marriages that were performed between 1890 and 1904 with the consent of church leaders range from about two thousand based on contemporary sources to a few dozen based on more recent research (Quinn 1985). Determining the exact number is difficult because the continuation of polygamy after the Manifesto was kept secret. It is clear, however, that the practice wasn’t limited to a few incidents. Church leaders actively sought ways to circumvent the law, thereby not only deceiving the American public and the government, but their own membership as well (Hardy 1992). Polygamous colonies were founded in Mexico and Canada, led by apostles Mathias F. Cowley and John W. Taylor. Polygamy was illegal in those countries as well but it was silently condoned in Mexico and kept a secret in Canada (Quinn 1985, Embry 1985). When the deceit of the Mormon church came to light during a series of Senate hearings in the years 1904-1907, apostles Cowley and Taylor were asked to resign to salvage the credibility of the church – as well that of church president Joseph F. Smith who had perjured himself to the committee (Wagoner 1989, pp. 153-176). This essay primarily addresses plural marriage as practiced by the Latter-day Saints between 1847 and 1890, following their exodus to the U.S. West and before the Manifesto. The relationship between polygamy and fertility (number of children) is very complex and not the same in every situation. The polygyny-fertility hypothesis maintains that fertility in polygamous marriages is lower than in monogamous ones. This effect has been observed in many studies (Winking et al. 2013) and also applies to nineteenth century Mormons (Josephson 2002; Moorad et al. 2011, cited in McKie 2011). In all likelihood, polygamy led to fewer children than probably would have been born in a monogamous society (Bean et al 1990, p. 136). 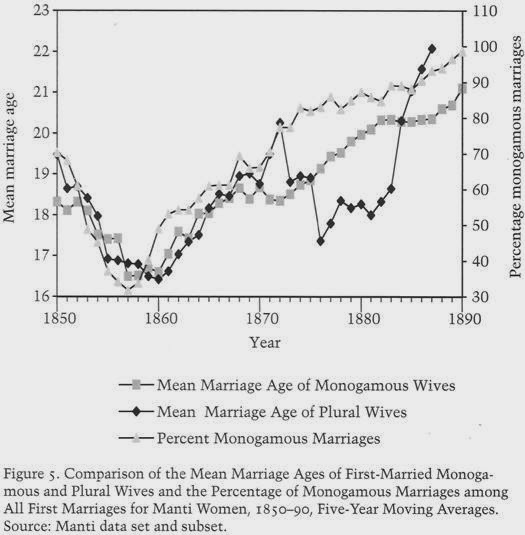 Marriage patterns were very dynamic in Utah between 1850 and 1890 and polygamy had a significant impact. The number of marriageable men (15 to 30 years) during this period was usually larger than the number of marriageable women. Polygamy only exacerbated this problem. As a result, men tended to marry late, often with women outside their own age category. It was not unusual for marriageable men to look for mates among 13 to 14-year old girls, while the other men only married in their 40s with women who were going on 50 (Daynes 1998). During a large part of the nineteenth century, then, polygamy made marriage available to almost all women but not to men. This problem is clouded from view because Mormon sources often work with numbers of people who were “ever married”. A 40-year old male and a 50-year old female may have been married at some point in their lives but their chances of a normal family life were zero. According to the source that is cited for this statement, this effect only applies when per-capita wealth is measured within families, not per-capita of the population at large. Since polygamous families are larger than monogamous ones, the per-capita wealth within a family is more evenly distributed. In Utah as a whole, the distribution of wealth was very unequal (Daynes 2001, p. 133). On average, church leaders were two to three times more wealthy than ordinary members (pp. 130-131), the top leaders even ten times (p. 128). The author cautions the reader, therefore, not to read too much into the effect of polygamy on the distribution of wealth: “To redistribute the wealth in the the territory when Utah was among the poorest areas gave no one opulence; for the most part, it simply mitigated the worst poverty and shared the burden of struggling for a living in a semiarid land” (p. 135). The ethnic composition of the population of Utah in the nineteenth century was extremely uniform; between 1850 and 1890, more than 99% of the population was white (Perlich 2002). Moreover, Mormons have traditionally been opposed to interracial marriages (Bulkeley 2007). It is not clear, therefore, what is meant by this statement. The article on lds.org refers to an unpublished source, which makes it impossible to find out. Both the Church History Library and the Western Historical Association have informed the webmaster of mormonism101.com that they do not have this presentation. The author of the source has not responded to inquiries. Plural marriage also helped create and strengthen a sense of cohesion and group identification among Latter-day Saints. Church members came to see themselves as a “peculiar people,” covenant-bound to carry out the commands of God despite outside opposition, willing to endure ostracism for their principles. For these early Latter-day Saints, plural marriage was a religious principle that required personal sacrifice. Accounts left by men and women who practiced plural marriage attest to the challenges and difficulties they experienced, such as financial difficulty, interpersonal strife, and some wives’ longing for the sustained companionship of their husbands. But accounts also record the love and joy many found within their families. They believed it was a commandment of God at that time and that obedience would bring great blessings to them and their posterity, both on earth and in the life to come. While there was much love, tenderness, and affection within many plural marriages, the practice was generally based more on religious belief than on romantic love. Church leaders taught that participants in plural marriages should seek to develop a generous spirit of unselfishness and the pure love of Christ for everyone involved. Although many Mormon women voluntarily participated in polygamy, not all did (Zeitzen 2008, p. 104). In reality, there was a lot less freedom to choose monogamy over polygamy than is suggested here, particularly from a theological point of view (Volf 1999). For 40 years, ever since the public announcement of polygamy by Brigham Young, Mormons had been “steadily taught and impressed” that polygamy “was a necessity to man’s highest exaltation in the life to come”(Proceedings before the Committee on Privileges and Elections 1904, volume 1, p, 18). According to Mormon researcher Kathryn Daynes, “without that doctrinal foundation, few, if any, would have entered into plural marriages” (Daynes 2001, p. 116). The promise of salvation as a means for applying psychological pressure had been part and parcel of Mormon polygamy since Joseph Smith told 14-year old Helen Mar Kimball that marrying him would “ensure your eternal salvation and exaltation and that of your father’s household and all of your kindred. This promise was so great that I willingly gave myself to purchase so glorious a reward”. Helen wrote about another polygamous relationship in which Joseph Smith engaged under the same pretense with 17-year old Sarah Ann Whitney: “No earthly inducement could ne held forth to the women who entered this order. It was to be a life-sacrifice for the sake of an everlasting glory and exaltation” (Compton 1997 pp. 349, 499). Most men who were asked to enter plural marriage were (prospective) church leaders. As pointed out in note 8, there was a strong correlation between having a Mormon leadership position and wealth. The correlation between leadership positions and the number of wives is even stronger (Daynes 2001, p. 128). Joseph Smith used polygamy in the 1840s to test his associates’ loyalty and to forge a link between prominent Mormon families (Foster 1981, pp. 150-151; Quinn 1997, pp. 163-197). This approach was upheld after his death, resulting in a ruling elite who are intimately connected through kinship and marriage. 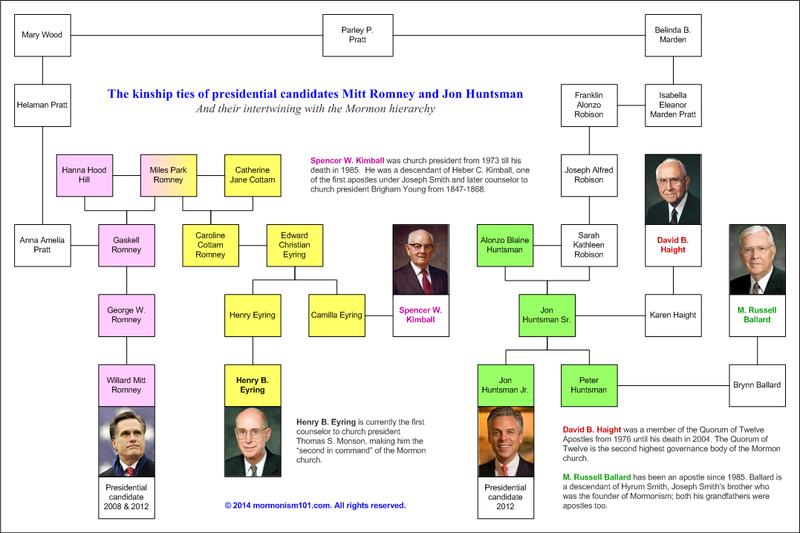 This effect can be observed in the Mormon hierarchy to this day, as illustrated by the infographic below, made for the 2012 US presidential election in which two Mormon candidates ran for office. Polygamy, kinship, power and money. It is always difficult to generalize about the experience of individual people. Nevertheless, all sources agree that polygamy was difficult for all those involved. Mormon polygamy was unique for two reasons. First because of its theological underpinnings and second because of the lack of a sociological context. Polygamy was foreign to anyone involved and there were no rules or guidelines concerning its practice (Zeitzen 2008, pp. 95-99). What few rules there were, in the Bible and in Joseph Smith’s 1843 revelations, were not followed. Most polygamous marriages were predicated on the religious conviction that it enabled the participants to reach the highest degree of glory in the afterlife. Moreover, many Mormons believed that Christ’s second coming was imminent which caused them to marry as fast and as often as they could in order to get a leap start in the millennium (Campbell & Campbell 1978). When the second coming didn’t materialize, the foundation of many marriages turned out to be insufficient for a stable relationship. Moreover, Mormon women were free to trade in their husband at any time for one with a higher leadership position in the church; this didn’t even require divorce papers (Wagoner 1989, p. 93). All of this turned Utah into a veritable divorce mill the the course of the nineteenth century. The divorce rate was not just high among Mormons but couples from out of state traveled to Utah because they could so readily obtain a divorce there (Cott 2000, p. 262). Although the authors of this essay appear to try and frame this high divorce rate in some sort of women’s rights narrative, contemporary non-Mormons begged to differ. To them, it confirmed that Mormon marital practices did not comply with the morals of the rest of America and used this in their fight against polygamy (Zeitzen 2008, p. 107). The lowering age at which women (but men as well) married was not so much a matter of the conditions in frontier areas as of the idea that they must get married sooner rather than later because Jesus was about to return any moment. This effect lasted until the 1857-58 Utah War, after which the marital age returned to normal (Daynes 2001, pp. 105-110). The chart above (Daynes 2001, p. 107) shows that the average age at marriage in the early years of the settlement of Utah was between 18 and 20 years, not “16 or 17 or younger”. The chart also demonstrates how the average age at marriage starts to increase around 1870. In 1869 Utah got connected to the US railway system and thereby became more susceptible for outside influences from the rest of American society. Almost all women married, and so did a large percentage of men. In fact, it appears that a larger percentage of men in Utah married than elsewhere in the United States at the time. Probably half of those living in Utah Territory in 1857 experienced life in a polygamous family as a husband, wife, or child at some time during their lives. By 1870, 25 to 30 percent of the population lived in polygamous households, and it appears that the percentage continued to decrease over the next 20 years. The experience of plural marriage toward the end of the 19th century was substantially different from that of earlier decades. Beginning in 1862, the U.S. government passed laws against the practice of plural marriage. Outside opponents mounted a campaign against the practice, stating that they hoped to protect Mormon women and American civilization. For their part, many Latter-day Saint women publicly defended the practice of plural marriage, arguing in statements that they were willing participants. After the U.S. Supreme Court found the anti-polygamy laws to be constitutional in 1879, federal officials began prosecuting polygamous husbands and wives during the 1880s. Believing these laws to be unjust, Latter-day Saints engaged in civil disobedience by continuing to practice plural marriage and by attempting to avoid arrest. When convicted, they paid fines and submitted to jail time. To help their husbands avoid prosecution, plural wives often separated into different households or went into hiding under assumed names, particularly when pregnant or after giving birth. By 1890, when President Woodruff’s Manifesto lifted the command to practice plural marriage, Mormon society had developed a strong, loyal core of members, mostly made up of emigrants from Europe and the Eastern United States. But the demographic makeup of the worldwide Church membership had begun to change. Beginning in the 1890s, converts outside the United States were asked to build up the Church in their homelands rather than move to Utah. In subsequent decades, Latter-day Saints migrated away from the Great Basin to pursue new opportunities. Plural marriage had never been encouraged outside of concentrated populations of Latter-day Saints. Especially in these newly formed congregations outside of Utah, monogamous families became central to religious worship and learning. As the Church grew and spread beyond the American West, the monogamous nuclear family was well suited to an increasingly mobile and dispersed membership.